The Eagle 3 Series of lift truck attachments utilize a heavy duty Eagle-Grip single automatic clamping mechanism for handling steel and plastic drums in high volume applications. The clamping mechanisms are completely mechanical requiring no hydraulic or electrical connections. 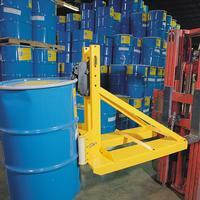 Positive actions jaws insure safe transporting of drums without damage to drum chimes. 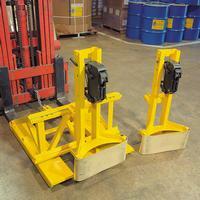 Carriage mounted models are available to mount directly on the carriage of most lift trucks. 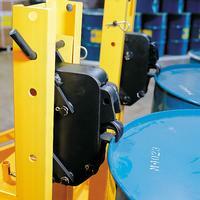 Attachments handling 2 or more 55-gallon drums are narrower than the width of the drums themselves. 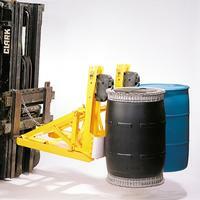 This makes easy unloading of drums which are tightly packed in trailers or overseas containers. Quick adjustable heads allow pickup of various drum heights. Standard heavy duty rubber belt bases support the lower side of the drum eliminating dents or cosmetic abrasions. 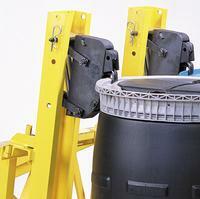 Fork mounted models enable lift truck operators to install/remove the attachment in seconds without any tools. Totally enclosed fork pockets with attached safety chain and cam lock secures the attachment to the lift truck.